A wordsmith dedicated to saving planet Earth through the wonders of technology. 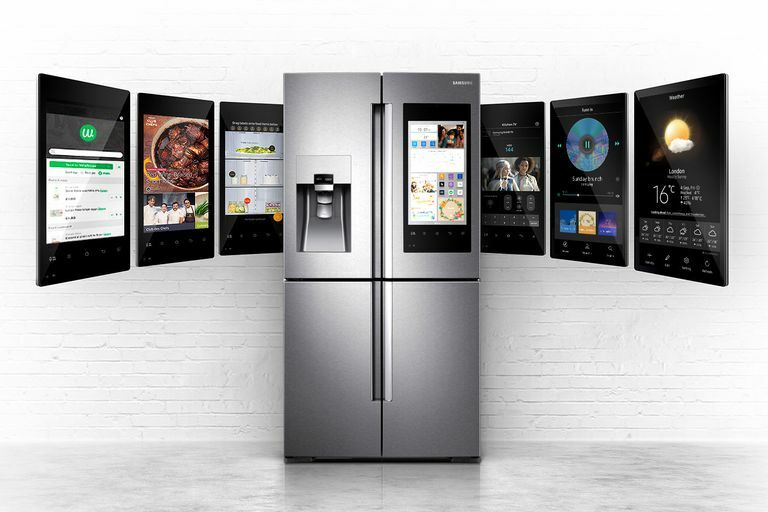 Smart refrigerators feature a touchscreen interface and ability to connect to the internet through Wi-Fi to provide a number of additional features. Smart refrigerators include internal cameras, more flexible user-controlled cooling options, and the ability for you to interact with its features using your smartphone or tablet when away from home. Some smart refrigerators can even connect with other smart devices in your home; such as speakers, smart TVs, and even your smart dishwasher or smart microwave. While exact features included will vary by brand and model, here is an overview of some of the many things you never knew a fridge could do. Keep in mind, not all smart refrigerators have the same features. Coordinate schedules for every member of the family. Look up recipes and have your fridge read the steps while you cook. Create grocery lists that sync to your smartphone in real-time. Set expiration dates and receive notifications to use food while its fresh. Create individual profiles for each family member to send them personal notes and to-do lists. Use a whiteboard option to leave messages for your family. Transparent touchscreens allow you to look inside the fridge without opening the door. Cast from a smart TV in another room to watch from the kitchen. Customize temperature by drawer or compartment. Use interior cameras while at the store to double-check if you’re low on milk or eggs. Alert you when the water filter needs to be changed. Turn the ice maker on or off from your smartphone. Some models of smart refrigerators provide both cold and hot water. You select a temperature and amount of water you want to be heated and your smart refrigerator sends a notification to your smartphone when your heated water is ready. A few even come with a Keurig single-cup coffee maker built in, saving counter space and making your morning routine just a bit simpler. Smart refrigerators have also incorporated sensors to make opening the door with your hands full no trouble at all. Sensors in the door respond to a gentle bump by opening the door for you. Some models have sensors at the bottom of the unit that respond to foot gestures to open the fridge door for you. And if the door isn’t closed securely, the sensors respond and automatically pull the door shut to keep your food fresh and prevent cool air from getting out and running up your energy bills. With all of the features and connectivity, many people have concerns about whether a smart refrigerator is a smart decision. Let's go over some of the common concerns many people have when it comes to making the investment in a smart fridge. Aren't smart refrigerators much more expensive than regular refrigerators? While they started out quite a bit more expensive, the prices have come down significantly as more brands and models have become available. Choosing a smart fridge over (non-smart) ones with a bottom-drawer freezer or a french-door style could cost as little a couple hundred bucks more or as much as a couple thousand dollars more. It all depends on the model and brand you choose. Can someone hack my smart refrigerator and take it over or use it against me in some nefarious way? The important thing to remember about all smart home technology that connects to the internet is that it typically uses the same Wi-Fi access you have set up for your other devices to access the internet, such as your smartphones, tablets, computers, and TV streamer devices. You always want to have your modem or router configured with proper security and complex passwords to ensure the safety of all of your connected devices and appliances. You might also be wondering what could be hacked. Well, the smart in smart refrigerator usually means a built-in computer with a screen and access to the internet. You can log into services you use every day so that, for instance, your calendar appears on the refrigerator's screen. That login information could be taken and used in other places (another reason why unique passwords for every service you use makes a lot of sense). Everything has some sort of vulnerability, so it remains to be seen how manufacturers handle these kinds of problems. Are repairs for smart refrigerators more expensive than ordinary refrigerators? Yes and no. The main components of the refrigerator such as condenser coils, fans, compressors, and so on would cost the same to maintain or repair as a regular refrigerator. It's still a fridge, ultimately. Where there could potentially be extra costs for repairs would be if special features such as hands-free door opening sensors, built-in coffee maker, or the touchscreen interface were to break down or fail. However, manufacturers designed smart refrigerators with typical family use and the average fridge lifespan (about 15 years) in mind. Will my smart refrigerator become obsolete when a new model comes out? Wi-Fi connectivity means your smart refrigerator could receive new software updates and likely new features as they are developed and released. Your smart fridge should get smarter and stay up-to-date with the latest technology over time. And most technology companies send through software updates during the night to avoid hassles for users, so updates should seem almost seamless. How Smart is Your Dishwasher?